Take six kids who are the product of human engineering, and pit them against a set of scientists who have decided to rid the world of millions of people, and you have the fast-paced plot of this sci-fi novel. These kids are bonded together by their lab experiences, and they are on the run - or in their case, they are on the fly- with the wings they unfold to the amazement of those around them. Really good book, it's full of action and tons of fun! Also super broody and dramatic, I like it! 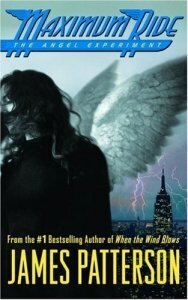 The book Maximum Ride: The Angel Experiment is an action and adventure story. It is about six kids, Max, Fang, Iggy, Nudge, the Gasman, and Angel. They are two percent bird, so they have wings and they can fly. These people called the Erasers are trying to kill them. The Erasers look like Super Models, but they can turn into wolves, and they are always blood hungry. The kids are flying to go get Angel back from the Erasers. Read the book to find out if Angel gets saved. I recommend this book to action and adventure lovers.